To mine bitcoin you need a computer or a mobile device with internet connection. 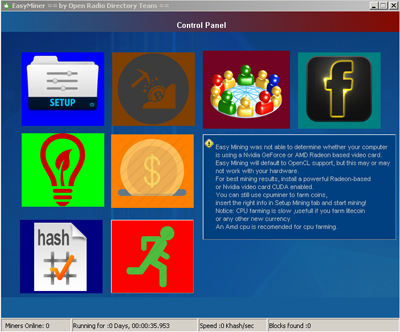 You also need to install a bitcoin mining software or an app to enable the mining process. Computer or mobile hardware is responsible for bitcoin mining speed and the amount of hashpower a miner have. But bitcoin mining software is also important, because without it mining is impossible. The last thing you need is a bitcoin wallet. The bitcoin the you will earn through mining will be transfer on your bitcoin address. There are different bitcoin wallets it is up to you what kind of wallet you like. There are different types of bitcoin mining. 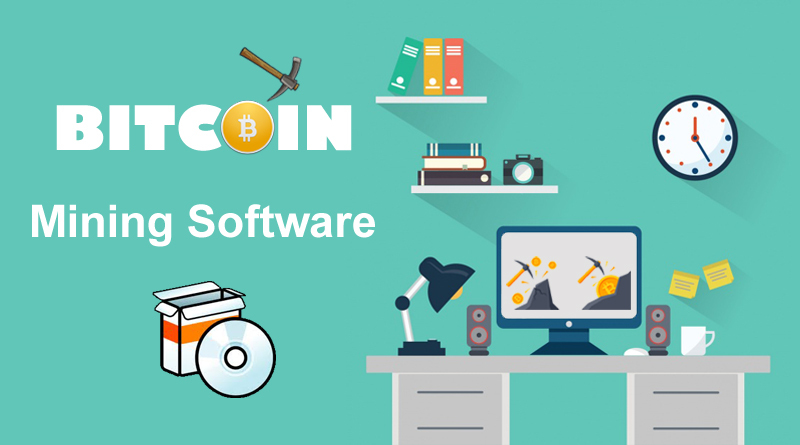 If you are a solo miner, these software you will able to connect to the blockchain and mine bitcoin. If you want to mine with groups you can also do it by joining the mining pool. Rewards are given to the group are distributed to the members. Cloud mining doesn’t need mining software because the cloud mining site will provide the members with software they’re going to use. Cloud mining is when you mine cryptocurrencies using a website that lets their member rents bitcoin mining rigs. Usually members pay for the rental and in exchange they will gain altcoins that they choose to mine. There are some cloud mining websites that offers free mining power to their members in exchange for traffic. 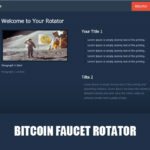 These websites usually have bitcoin faucets that rewards members by claiming free satoshi everyday and exchange it for hashrate. Before you start mining you should consider using a bitcoin mining calculator. The Software use in mining is free but, you will spend money on hardware maintenance and electricity while you are mining bitcoin. 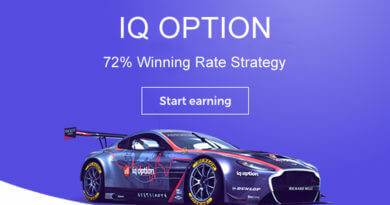 This helps a lot because you can see if you will profit from mining or not. 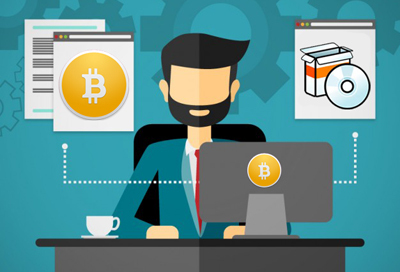 Bitcoin mining software is responsible for informing the bitcoin network of the work done by the mining hardware and also to receive the work of other miners on the network. It also responsible for displaying the hashrate, temperature of your computer, speed of the fan and actual speed of your miner in real time. 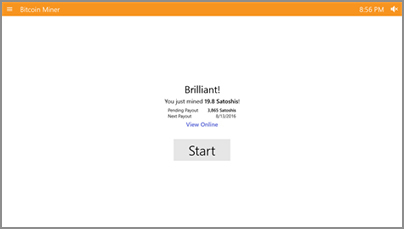 Bitcoin Miner is free, light weight and easy to use bitcoin miner app for Windows 10, Windows 8.1, Windows 10 Mobile. Works with Sha-256 and Scrypt Mining Algorithms. You can use your CPU or GPU to mine bitcoin. Also capable of joining group mining or mining in a pool. You can also use it on a computer with DirectX 10 & 11 GPU mining and running on Windows 8.1 and 10. They have the same name but they have two different installers. You can download download the installers below by clicking the links. For Mobile Phone – you only need to get the free apps Here, install it in your mobile and click start. 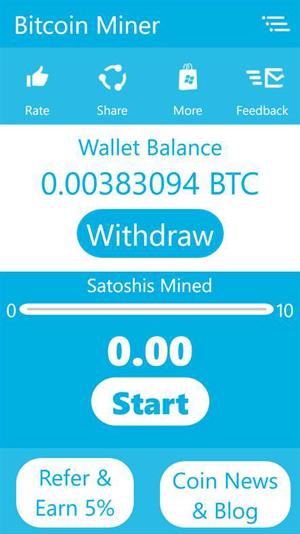 You mobile device will start mining bitcoin and you will earn after a block was mine your group in the pool. 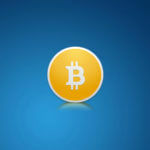 For PC – To download the bitcoin miner please visit this link Here. Just donwload the bitcoin miner and install in your computer. After the installation double click the icon in the desktop and finally click start. Be sure you are running in windows 8.1 of 10 to be able to download the installer. BFGMiner is a modular ASIC/FPGA miner written in C, featuring dynamic clocking, monitoring, and remote interface capabilities. You can use this for windows 32 bit and 64 bit. Before you download which installer is right for you look what architecture your Windows OS is running. You can see the updates and technical issues Here. Easyminer is free and an open source. You can see the source code and modify it as per your needs. It is very easy to use because of the user interface is easy to get use to and understand. It supportes two algorithms, the SHA-256d and scrypt(1024, 1, 1) giving it the miner ability to mine both bitcoin and litecoin. Miners also have the option to chose what hardware their going to use for mining weather their CPU or GPU. 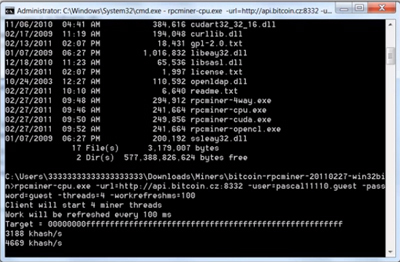 RPCminer is a a 4 way CPU miner, OpenCL for ATI Video Cards and CUDA for Nvdia GPU can be used on Mac OS 10.6 or higher. 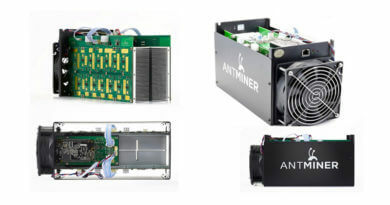 Easyminer supports different hardware. Before start installing the miner you need to know what video card brand your computer is using. If it is ATI brand you need to chose the OpenCL miner and for Nvidia you need to install CUDA. 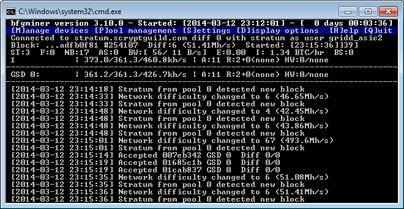 If you don’t have a video card you can still use rpcminer using your CPU. Open the folder and look for the read me file. Open it and look for the RPC miner client arguments. Replace the URL, username, password, trends from your account in Slushpool. In URL just replace it with the url of slushpool.com, your username and password you use in registration and trends is the number of CPU your computer have. If your computer is quadcore you need to enter 4. Go to the files that you extracted on your c:\ using command prompt. If you extract the files in C:\foldename, then you have to type c:\foldername then press enter. You can now see the block your computer is mining into and the hashrate of your computer’s CPU. If you have error and your miner is now working, please check the information you enter in the command line. 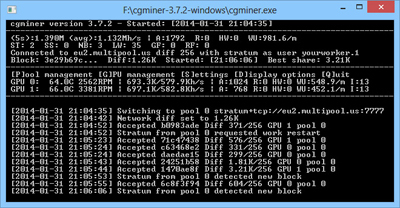 CGminer -is a ASIC miner for bitcoin and have the ability to join multi-threaded multi-pool FPGA. You can mine bitcoin or litecoin depending on your preference.